Easy, Medium and Hard, all equally matched. Match making is looking better for me too. I created an account just to complain about this. Things had been just fine with the matchmaking. Hard was harder than medium, which was harder than easy. I was able to get decent streaks going, which is necessary if you want to have any chance of getting to legend in a reasonable number of matches. You want people to be able to win at least 3/4 of their matches. Yes, there should be some challenge, but you do want people to be able to work their way up with a pretty high win rate. You want players to be able to have some good streaks. I was losing about 10% of matches I started, and that was reasonable. Suddenly today I can't win a match. Every opponent is 5200 rune power. Hard, medium, and easy are all the same. This is ridiculous. @Glargg so I'm guessing you took advantage of the easy MM and now are complaining that you actually have to raid Boss 100 defenses. No, this is legend 3. This is completely different from all previous seasons. I'm in Legend I and went from being matched with 16-19k lvl 66s to 25-30k lvl 70s.... much better system. 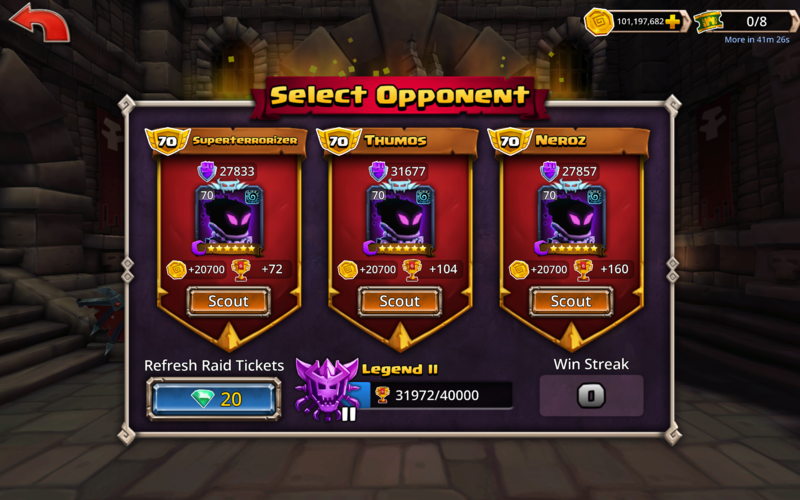 When I was in Legend III, I was getting very easy fights as well. It was almost inverted from what I recall. Warlord had hard matches, when I hit Legend they were far easier. Well, now matchmaking seems to be back to normal. I don't know what happened last night. Glargg, this is what happens when a vocal minority complain...pvp is just insanely difficult. It was grueling for me to get to Legendary II (the amount of loses I incurred to get there + 99% of the time even if I was only hit as little as once or twice a day it was always a loss for me), and I was fine with top 100 slaughtering me when I popped up in their pvp list. What I liked is that they were not permanent fixtures in my pvp list and I had a shot getting a 9-25 pvp win streak going (it has been ages since I could consistently get a 30-40+ win streak going). Now it really does not matter if the Solaris team that hits me is level 62 or 70, I just get butchered...I just transitioned to an okay guild (over 3,300 crowns at the end of last week), and boom...pvp becomes hellish. I am going to be useless to my guild in the next guild games that focuses on PVP as I have a long way to go before I can even think of having a shot at winning some of the battles I am presented with as my 3 options. I feel that what happened with PVP is a be careful what you wish for situation, people complained, DB responded, and well...the cure seems to be worse than the disease. It should be difficult to get into the top pvp tier.